You must first enable offline mode in your Transaction Center. If on a computer go to this site and sign into your transaction center. You will be brought to the Product Hub, select Transaction Center. If accessing from the app, tap the bar to the left to access a pull out menu, and select Go to Product Hub. In the Transaction Center, go to Main Options Mobile Settings. In the Mobile Settings Section, ensure that the radio button next to Enable Recurring Billing is set to On. 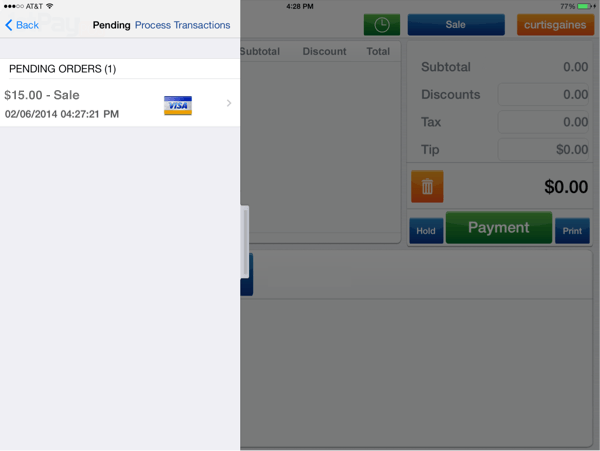 Return to the 1stPayPOS app. When you do not have an internet connection and Offline Mode is enabled, you will see that OFFLINE appears in red letters at the top left of the screen. You can now run transactions without an internet connection. Cash and Other Payment Type transactions will be stored as usual. To store credit and gift card information to be processed when an internet connection is available, swipe the card from the Payment screen. All offline transactions must be manually submitted for processing when an internet connection is available. See section below. NOTE: This is only available for Retail MIDs, not Restaurant MIDs. Once you've stored card information in offline mode, the transactions must be submitted for processing when an internet connection is available. Tap the bar to the left to access a pull out menu. The offline transactions will be listed. At the top, select Process Transactions. The transactions will attempt to get an approval. A pop-up box will appear, showing how many transactions were approved and declined. If any transactions failed, the Offline Transactions will show a Failed Offline Transactions menu. Tap Failed Offline Transactions. The Failed Transactions will be listed. At the top right, select Process Transactions to retry the failed transactions.